Completing the final night of his seven-day residency at London's O2 Arena, Drake brought out J. Cole who took the stage to perform his latest hit record "Middle Child." 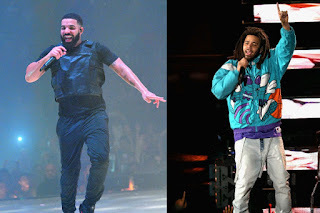 In addition to the surprise performance, the two global artists also took a moment to share their respect for one another's success and significance to the rap game, while also insinuating that they might have some new music on the way. As J. Cole took the mic to call Drake "top 5 if not arguably the best rapper to ever come in this m*****f*****," the 6 God went on praise Cole for never compromising his integrity while continuing to only get "bigger and better." From there, he also expressed his desire to get back on a record with Cole, passionately stating that "I can't wait to make some new music with you. I know we been working and I can't wait to let these people hear it."